There are actually only two types of popcorn, but a host of varieties. They are butterfly and mushroom. The butterfly style pops into a large, fluffy and irregularly shaped piece of popcorn. Mushroom style burst into smaller and more compact morsels. 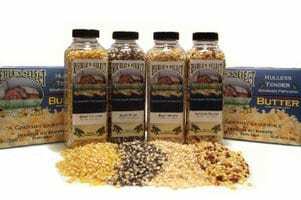 Commercial popcorn companies oftentimes mix both types in their products. That is why sometimes the popcorn will be big and fluffy while others are tighter and smaller. Mushroom type are best used for candy-coated popcorn. Many companies label some of their popcorn kernels as being hull-less. This is actually not correct. Popcorn would not be able to pop if it didn't have a hull. They should explain that once the popping corn is popped, there is less of a hull left than with other varieties. Yellow popping corn will produce large pieces of popcorn when popped. Of all types of popcorn these are the most widely grown variety and are also the cheapest kind to purchase. The White variety is also quite popular. The pieces are fluffy and quite large once popped. They have a very mild corn flavor. Red popcorn kernels are quite small compared to other types of popcorn but burst into big florets or flakes. Sometimes the popcorn will have tiny, red flecks. Red popcorn has a slightly nutty taste. The Blue variety of popcorn is not very well-known amongst popcorn enthusiasts. The kernels explode into very large white pieces of popcorn that have minute, blue speckles on them. This type of popcorn has a unique flavor that is very different than other varieties. Black popcorn is another variety that most people have never seen. They burst from the black hulls as a stark white snack. The popcorn is moderate in size. This style is a bit crunchier than other types of popcorn. Baby Rice kernels are very small and tender. They are classified as hull-less but this is not the case. This variety of popcorn is more flavorful than most other kinds. Brown popcorn is quite unique. Once popped, they produce large white pieces of popcorn. It has a flavor that is similar to that of yellow popcorn but a bit stronger. The Purple variety has small kernels that pop into medium sized morsels. This is one of the most tender types of popcorn. It has a strong, nutty flavor.